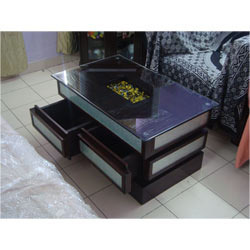 Our organization is dedicatedly engaged in offering supreme quality Fancy Center Table. These tables are manufactured using supreme quality wood material and like sheesham, oak, maple and glass. Our offered tables are widely used in various hotels, houses, offices and other kind of interiors. We manufacture these tables in different lengths, thicknesses and designs that can be customized as per the requirements of our clients. Our company “Bharat Bhushan & Co.” was established in the year 1997 as a sole proprietorship based company with its office situated at Delhi, New Delhi (India). We are amongst the leading supplier and service provider of Residential and Commercial building product and services. Our product line includes Manufactures, Suppliers, contractors, Exporters, Interior Designer & Decorators and many more. These services are highly appreciated for their reliability, affordable prices and commend ability. With our commendable services, customers can easily get a true value to its money as we are committed to organization growth in terms of our business valued and success. Every organization sees a dream of growth and success, but the realization of it requires constructive planning and relentless efforts. To make convenient our clients with our services we offer them different modes of payments. The range of furniture items offered by us reflects our excellent craftsmanship and creativity. We make sure to design these products as per the latest market trends and clients' preferences. Moreover, we provide the facility of customization to meet the exact needs of the clients in the best possible manner. Our range of furniture items is widely appreciated for their termite resistance, unique design, mesmerizing look, fine finish, high level of comfortability and durability. These products are checked on certain well-defined parameters to ensure their flawless nature, before their dispatch to the clients' end.